Peal, wash and dice the potatoes into about ¼”-½” cubes. Clean and wash capsicums. Cut them in squares of about the size of the potatoes. Add the potatoes and fry on medium heat. Once the potatoes are lightly brown in colour, add the capsicums. 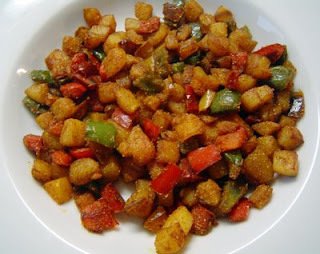 Fry till the capsicums are also fried a little and the potatoes and the capsicums are cooked. Now add the sambar masala and the red chlli powder. Stir for about a minute and remove from heat. *Add any kind of coloured capsicums as per availability. It looks better if you can use both the colours.